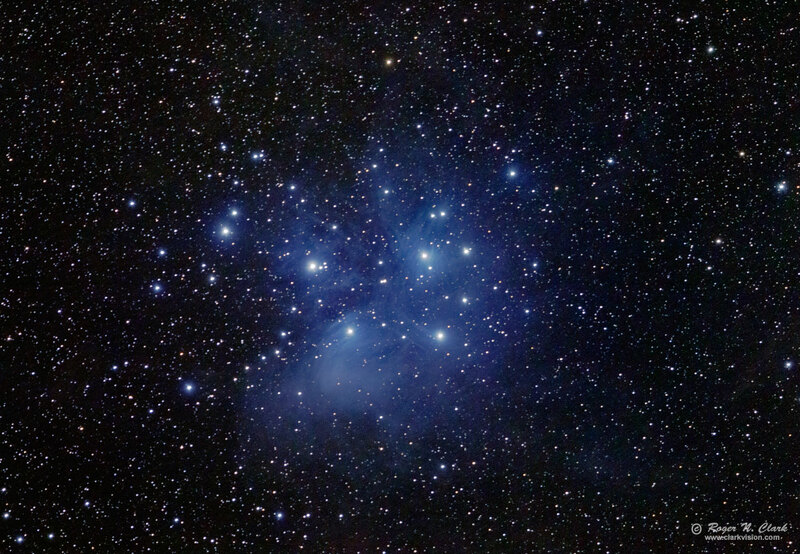 The Pleiades star cluster, also known as the Seven Sisters is immersed in nebulosity due to scattered starlight. The surface brightness of the nebulosity is very low (see surface brightness of the nebulae in M45 ). Technical. Canon 7D 18-megapixel digital camera, Canon 300 mm f/2.8 II lens at f/2.8. 25 one-minute exposures at ISO 1600 were added (25 minutes total exposure). No dark frame subtraction, no flat fields, no noise reduction. Tracking with an astrotrac. Slight crop. CEFA = 19700 minutes-cm2-arc-seconds2 (2.96 arc-seconds / pixel). Modern DSLRs like the 7D include on sensor dark current suppression and low fixed pattern noise at ISOs around 1600 and higher, making no need for dark frame subtraction. Modern raw converters correct for light fall-off and also correct for hot/dead/stuck pixels. This makes processing low light images easy: simply align and average.